Kansai Leverages Modern LAN Principles to successfully modernize to IP, saving over $75,000 and accelerating the deployment of Xovis Person Tracking Sensors. 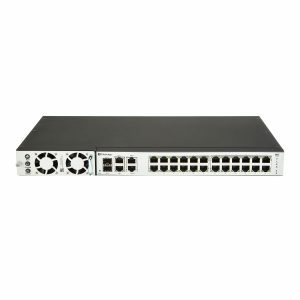 The FLEX managed switch delivers fast Ethernet and PoE++ (50 watts per port) over multiple pairs of UTP cable with six times the reach of traditional switches. Accelerating your return on investment by reducing infrastructure costs. Collapsing planning and deployment time. Eliminating infrastructure barriers, risks, disruption and costs. Creating a robust IP platform that is easy to configure, deploy and manage. The Flex switch can operate in standard mode (without an adapter) and long reach PoE mode for extended reach. One switch, many options. Power sharing for redundancy, load balancing, AC/DC options, hot swappable power supply and auto sensing 100-240VAC delivering 500 to 1,000 watts of power. FLEX is one of the most energy efficient switches on the market consuming less than 20 watts of power to operate. Power management by port for easy reset of ports. Port MAC locking for higher security and peace of mind. Simple Network Manager, an intuitive web GUI that makes managing the switch a breeze. *Optional 1000W and 1600W power supplies available at additional cost. – Built-in RADIUS client to co-operate with the RADIUS servers, when installed. – RADIUS / TACACS+ login user access authentication, when installed. – SSH / SSL secure access, when installed. · User privilege levels control, with TACACS only. NV-PL-1110-PWR Increase the power budget of the FLEX switch to 1,000 watts if 110 power source is available. NV-PL-1000-PWR Extra power supply that comes standard with the FLEX switch delivering 500 watts of power if 110v power source or 1,000 watts of power if 220v power source. NV-FLXLK The FLEX Link adapter is an Ethernet extender that extends Ethernet and power over 2 or 4 pair UTP. It is used with the FLEX 24 Port switch and FLEX 8 Port switch to support long reach requirements. The FLEX Link can be locally powered to provide higher power to the end point. NV-PL-DCCBL Pack of 4 DC cables to connect 4 FLEX switches together to enable power sharing for redundancy. BPDU Guard is now available for loop protection on downlink ports. MAC locking now supports up to 4 devices per port. Power Supply max setting now up to 58 Volts. Port Security enhancement, auto lock on link down. Timezone support has been disabled. Port reset will now also reset the link of IEEE Ethernet devices. VLAN configuration will no longer get corrupt in certain circumstances. Hostname command no longer accepts whitespace. Port uptime counter will not drift. Ports will now reset data if PoE is disabled. LLDP no longer flows through to uplink devices when LLDP is enabled. LLDP will now advertise as a switch. Pal-show-voltage will now display in volts. Web GUI TX/RX percentage bar will now update based on port speed. Pal-set-port command will now work correctly in the console. Spanning tree now will start up earlier to prevent loops. Changing the hostname does not update in the command line prompt until the next session. When a timezone is set, some syslog message timestamps are the set timezone, while others are in UTC.